This might come as a shock for most: But the worlds largest Sci-Fi series is....German. 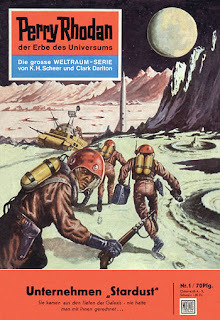 This Space Opera is called after its main protagonist (Perry Rhodan) and has been churned out weekly since 1961, with almost 3000 installments to date. At least that could be extrapolated from the "strict" commando tone in the earlier novels, with the protagonists escalating conflict after conflict, while pilfering any higher technology to support their jolly colonization raid. 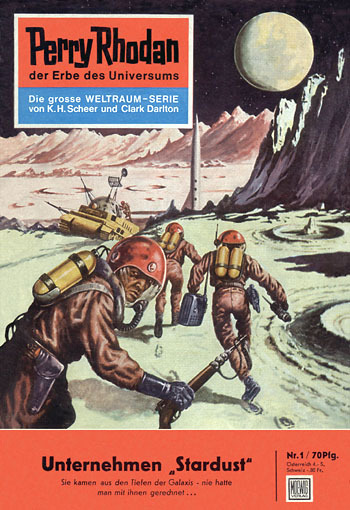 The story starts in 1971 with the first manned moon landing by US Space Force Major Perry Rhodan and his crew. The stumble over a 500 m large, stranded space ship from the planet "Arkon" with a bunch of decadent aliens on board. What can I say? They use the technology and know-how from that space ship and the two survivors (after the Americans blew the star ship up in a second moon mission) to "uplift" the entire human race. But also weirdly addictive. I have been consuming ("reading" has nothing to do with it) a LOT of PR novels and stopped doing so when I grew out of it. Until the series got rebooted with the plot taking of in the early 2030. It is called "Perry Rhodan NEO" and is running parallel to the old series. I kind of enjoy the stale taste of the 60ies gone and am (secretly) enjoying the stories as audio books.